Gum Disease and Rheumatoid Arthritis May Have Common Origins –Good oral hygiene is essential for people with RA. Good oral hygiene is essential for people with RA. By Maureen Donohue, Contributor |May 17, 2017, at 10:16 a.m. It is critical for people with rheumatoid arthritis to visit their dentist regularly. Take care of your teeth and they’ll take care of you. The origins of this adage are unknown, but modern research has confirmed that oral health and systemic disease often go hand in hand, something physicians have suspected for more than 3,000 years. Hippocrates, the ancient Greek physician who is widely credited as the father of modern western medicine, advocated pulling teeth to cure arthritis. Although dentistry is more advanced today than it was in ancient Greece, Hippocrates may have been on to something, especially with regard to rheumatoid arthritis. Researchers have recognized the link between periodontal disease and RA for decades. Several studies have found that people with RA are more likely to have gum disease than their counterparts without RA – in the case of one German study, the rate of periodontitis was eight times higher – and that their periodontitis is typically more severe and involves more tooth loss than study participants who do not have RA. Both RA and periodontitis are chronic inflammatory conditions, and they share some of the same elevated blood levels of certain inflammatory biomarkers, such as interleukin-6 and tumor necrosis factor-alpha. They also appear to share a genetic link. In one study, Israeli researchers found HLA-DR4, a genetic marker that is often seen in people with RA, in 80 percent of patients with rapidly progressive periodontitis, compared with just a little over 33 percent of healthy, matched controls. If left untreated, RA and periodontitis attack healthy tissue, and the type of harm they cause is “remarkably similar,” according to Dr. David S. Pisetsky, a professor of medicine and immunology at Duke University School of Medicine in Durham, North Carolina. In the case of periodontitis, inflammation damages the gums and supporting ligaments surrounding the tooth, eventually invading the jawbone and causing bone loss. With RA, the inflammation first attacks the synovium, the soft tissue that lines the joints, and progresses to the bone, which can also eventually result in bone destruction. The similar mechanism of action of the two conditions “is well-substantiated in the literature,” says Pisetsky. But could periodontal disease and RA be related to one another on a more fundamental level? Is it possible that they share the same trigger? “There has been a lot of research into the different relationships between periodontal disease, RA and bacteria,” says Dr. Richard H. Nagelberg, a dentist in private practice in suburban Philadelphia and regular columnist for the journal Dental Economics. One particular species of bacteria, Porphyromonas gingivalis, often present in both periodontitis and RA, is considered especially interesting. According to Nagelberg, it is unique among bacteria because it “contains an enzyme that the body recognizes as a foreign substance,” Nagelberg says. This unusual characteristic of P. gingivalis may be responsible for the autoimmune response seen in RA, in which the body’s immune system views its own healthy tissue as a foreign invader and sets up a misguided attack. It may also be responsible for the inflammation produced by periodontitis, which could have an autoimmune component, as well. 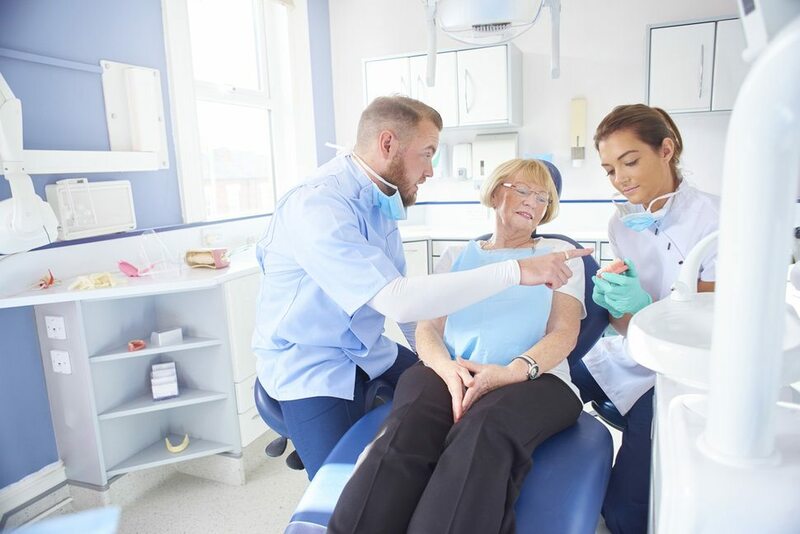 Current studies indicate that controlling the symptoms of RA with disease-modifying antirheumatic drugs and biologic medications can also improve periodontal disease in many people, but the evidence is not definitive, he adds. In the meantime, Nagelberg tests all his patients with periodontal disease for the presence of P. gingivalis using a simple “swish and spit” test in which patients rinse their mouths with sterile saline and then spit the solution into a vial, which Nagelberg sends to a laboratory for analysis. He also tests all his patients with RA, whether they have periodontal disease or not. If the test is positive, Nagelberg treats any periodontal disease by ordering a cleaning to remove the buildup of tartar on the teeth and, if appropriate, by prescribing antibiotics and possibly surgery for more severe periodontitis. For patients with RA and a positive test for P. gingivalis but no gum disease, he makes certain that they maximize their oral hygiene by using an electric toothbrush twice a day and by cleaning between the teeth with floss, an interdental pick or brush, or an oral irrigator, a device that delivers a steady stream of water that washes out food between the teeth. “I advocate whichever tool works best for each patient, depending on their dexterity,” Nagelberg says. In addition, he stresses that it’s critical for people with RA to come in at least twice a year for cleanings and exams, and more frequently if their manual dexterity is impaired to the point where it is difficult to take adequate care of their oral hygiene. Pisetsky also recommends that all his patients with RA visit their dentists regularly. “It’s important because periodontal disease is not always obvious,” he says.